While ICT has a huge impact on everyday communication and social participation, elderly people struggle to overcome technical barriers such as complex interaction with devices and services. With BRELOMATE their own TV becomes the center of gaming and video communication. Low interest or participation of senior citizens does not take origin in an ignorance about online services but rather in their complexity and in a lack of support, training and learning. The inexpensive home setup designed by Brelomate consists of three potentially available devices: a TV plus set-top box, an internet router and a tablet. The Brelomate second screen tablet app is a control unit that interacts with a set-top box for game visualization and live communication. As a first step, a market-ready product will be designed and developed by continuously involving prospective users. An extensive field study includig 36 households is carried out, with the aid of a didactic concept for facilitators and an accompanying social science study. 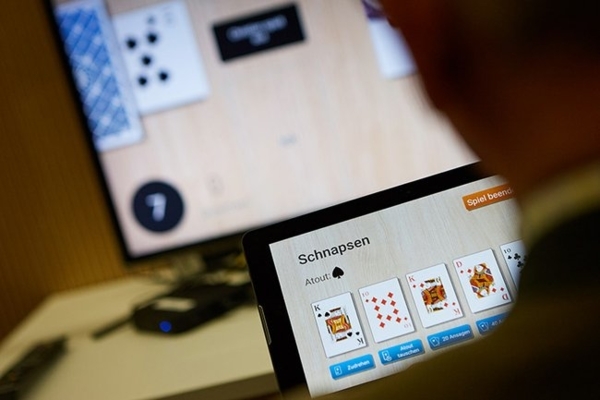 Ten retirees between the age of 61 to 83, who enjoy playing the popular Austrian turn-based card game Schnapsen, participate in the usability tests, which are conducted at their homes as well as in the usability lab. A commercialization strategy for the market launch will be developed as well. Brelomate 2 was also featured as best practice example on Open Innovation.